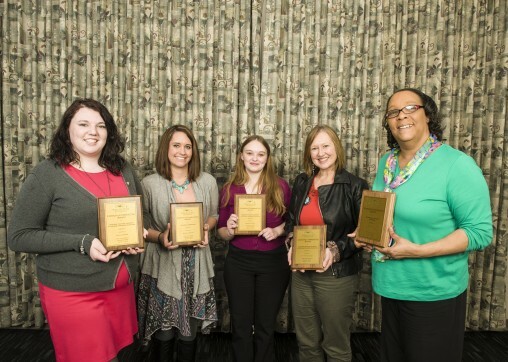 (L-R) Elsie winners: Students Kaytee McBride, Bethany Foureman and Samantha Stewart with Kirsten Halling, associate professor of French, and Charene Thornton, student services coordinator. It’s no secret that adjusting to college life can be difficult. Wright State University’s First Year Programs are designed to help students thrive, not just survive. The programs were established to ease the transition to college—promoting student connections with professors, fostering academic success and helping with the declaration majors. Part of University College, the First Year Programs also sponsor learning communities, the common text program, diversity events and service-learning opportunities. Catherine Queener, director of First Year Programs, says participation in the programs is one of the best things students can do for themselves upon coming to Wright State. 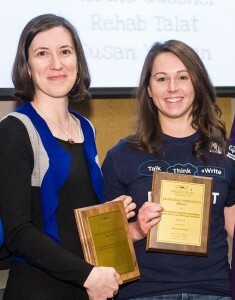 (L-R) Teaching team Amber Vlasnik, director of the Women's Center, and student Melissa McCune won the Holly Jackson Award for Outstanding Innovation in Co-Curricular Activities. Queener said the program has long-term benefits. Students who participate in learning communities have a higher rate of graduation and higher GPAs than students who do not participate. “On interviewing older students who took First Year Seminar as a new student, we very often learn that the student’s current roommate or best friend is someone they met in their First Year Seminar class,” said Queener. Each fall, the learning community program employs more than 50 student leaders to teach First Year Seminar as peer mentors/instructors to help new students find their way. First Year Seminar instructors make sure new students understand what to do to enter a major as soon as possible, how to write an email to a faculty member, how to access campus resources, how to get involved with the Wright State community and much more. On March 11, the Learning Communities Awards recognized seven special instructors for their outstanding teaching abilities in the Fall 2013 First Year Seminars. Awards were handed out for outstanding innovation in co-curricular activities, excellence in Learning Communities instruction, outstanding collaboration and outstanding innovation in teaching.